Everybody loves cake, right? Cakes have layers. Mmm…. cake! We’re sure you’ll also love PiBakery, a brand new way to bake Raspberry Pi images, which makes creating a custom image a… piece of cake. PiBakery was created by David Ferguson. He’s a talented 17-year-old whom we first met at the Big Birthday event we held to celebrate four years of Pi back in February. He showed Liz and Eben a work-in-progress version of PiBakery, and they’ve been raving about it ever since. This crafty program enables users to mix together a customised version of Raspbian with additional ingredients, and you need absolutely no experience with computers to set up your custom image. In PiBakery, you drag and drop blocks (just like Scratch) to add extra components. PiBakery then mixes the latest version of Raspbian with its additional sprinkles, and flashes the result directly to an SD card. 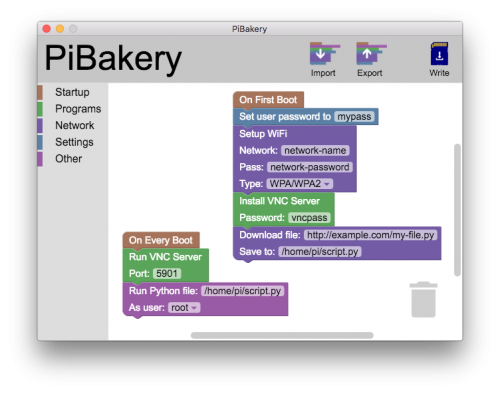 PiBakery is available for Mac and Windows, with a Linux version on the way. It can be downloaded directly from its website. As well as the scripts and block interface, it contains the whole Raspbian installation, so the initial download takes quite a while. However, it makes the process of building and flashing SD cards remarkably simple. David has written a guide to creating customised SD cards with PiBakery. It’s a very easy program to use, and we followed his guide to quickly build a custom version of Raspbian that connected straight to our local wireless network. Guess what: it worked first time. 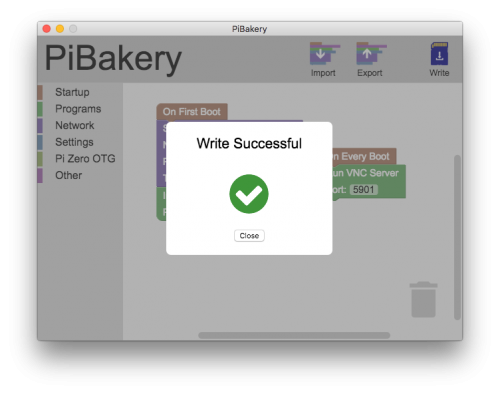 Behind the scenes, PiBakery creates a set of scripts that run when the Raspberry Pi is powered on (either just the first time, or every time it is powered). These scripts can be used to set up and connect to a WiFi network, and activate SSH. Other options include installing Apache, changing the user password, and running Python or command line scripts. The user controls which scripts are used with the block-based interface. You drag and drop the tasks you want the Raspberry Pi to perform when it’s powered up. Piece of cake. We love PiBakery, and cake. Did we mention cake? That’s truly brilliant. I’ve been looking into automating the provisioning of Pis with Ansible but the first few steps still need to be done manually. I will have fun playing with this! Thanks so much for your feedback – I’m glad you like PiBakery, and I hope that it makes your setup easier! This looks amazing. Does it only run on Mac and Windows, or is there also a Linux / Ubuntu version available? Read the post you’re replying to! Does the upcoming Linux version mean this can be installed on a Pi? Or is it only compiled for x86 Architecture? Brilliant! That is so visually clever! For a 17-year-old boy, it is a great achievement. It is a very useful software. Thanks for sharing too. I will take a note of it. To be honest, it’d a pretty great achievement for someone my age too. David’s done an exceptional job here. Nice job, this is going to make Pi setups a snap. Thanks very much for making this work! Keep it up, David. You’re going places. I’m sure that if you go to college and eventually become a software engineer you can do for Azure or AWS what you’ve just done here (forget client-side OSes like Windows, Linux or OS X) apply this to patching together XaaS-type services on Azure or AWS and you’re set for life. Yes, met Dave at Cambridge on Raspberry pi bday event. Was waiting for PiBakery from that time!! Kudos to this young man’s fantastic work.. THIS IS AWESOME!!! I’m going to download this as soon as I can! Great job on this application David. It looks pretty sweet. Thanks for your feedback! I’m really glad you like PiBakery! Thanks for the great blog post Lucy, I’m glad you like PiBakery! One quick thing I’d like to add is that anyone can create and add blocks in to PiBakery – see the guide http://pibakery.org/docs/contribute.html for more information on how to do that. If anyone has any questions, suggestions or feedback, I’d love to hear it! Tweet @PiBakery and I’ll be sure to reply, or I’ll try and reply here too. And finally, to stay up to date with the latest PiBakery news, including bug fixes, updates and new blocks, make sure to follow @PiBakery on Twitter! It should be here very soon, and there may even be a version that runs on Raspberry Pi! Would you please provide checksums for the pre-compiled downloads? Again, great work! Keep it up. Sure, I’ll do that very soon. I’m really glad David’s work is being noticed – I met him at the birthday party as well and he was a really nice guy. His tool saves me quite a lot of time! Wow, Absolutely and utterly Wow. David is 17 now which would make him around 14 when the Raspberry Pi was first introduced. I wonder if he is proof positive of the benefit of the Introduction of the Raspberry Pi or if he is just a natural talent. I wonder if he was the recipient of one of the first Raspberry Pi’s to roll out of the factory? This is very impressive for a programmer of any age. Congratulations to David. While I hate to say it, wait a bit so I can download the free version, but I would be happy paying for such a great utility as this. Although I didn’t get one of the first Raspberry Pi’s, my teacher did in June 2014, and that certainly inspired me to keep on programming, and try out physical computing. And although I’ve been told a few times now that I should charge for it, I’m going to keep it free forever, in the hope that PiBakery might one day inspire other 14 year olds to get into programming and physical computing, just as Raspberry Pi did for me. I agree with that completely. this software is good enough for someone to make some money off of but I would be heartbroken if I couldn’t use it, and explore it, and modify it for free. Well done young man. To create software you are proud of is a every programmers goal; but for others to enjoy it is the dream. I have been programming for well over half my life and it has led me to some of my greatest achievements, I’m only 32. Continue striving to produce great things and you will be recognised for that, for as long as you do so. Again, well done! I’ve added a donate page to the PiBakery website (http://www.PiBakery.org/contribute.html) and any donations would be greatly appreciated. But do know that you don’t have to donate – I’ll always keep PiBakery free forever! Super impressed. Keep up the awesome work! This is SO COOL!!! could it be modified to build your own custom OS perhaps? that would be utterly awesome! I’ll be adding in an option to use Raspbian Lite rather than Raspbian Full, so that’ll bring it a little closer to building your own OS. Great stuff, this looks like a very useful program! In addition to adding things, in some cases it is also useful to have the ability to remove things from the standard Raspbian distribution. For example in headless embedded systems there are many things you don’t need or want. I’ll be adding in an option to use Raspbian Lite rather than Raspbian Full, so hopefully that’ll help. If, however, you just want to remove a few packages you can always use the “Run Command” block and apt-get remove a few things! Avast kills the install saying its malware?????? and then requires a boot time scan WTF?? That’s probably because I haven’t code signed the installer. I have actually bought a code signing certificate, but I haven’t got it yet (it’s been two weeks). I’m hoping that I’ll get it soon, and I’ll then be able to sign the installer. Avast reports the Windows installer as infected. That’s just because I haven’t signed the installer. I have actually bought a code signing certificate, but I haven’t got it yet (it’s been two weeks). I’m hoping that I’ll get it soon, and I’ll then be able to sign the installer. This is a great program and should help many people. Very well done. There’s an interesting idea… I wonder if David could make a “PiBakery Lite” (or maybe “Diet PiBakery”) based on the “Rasbian Lite” distro, in addition to the current full-fat Rasbian PiBakery version? Having support for Raspbian Lite is possibly the most requested feature right now (along with a block for static IP), and I’m working on that right now. I’ll probably have an option in the installer of which one(s) you want to install, and then you can select it from the “Write” window. My only concern is that I’ll need to make sure all the blocks are compatible with Raspbian Lite – some may require packages that are installed already in Raspbian Full. I’ll go through them and check them all. Follow @PiBakery on twitter to get notified of when that update is released! That’s coming – follow @PiBakery on twitter for more details! 1. The image above shows Pi Zero OTG in the menu, but the image on the PiBakery site does not. Is this available, and if so what does it do? 2. Is it possible to choose Jessie Lite as the OS? 1) There are Pi Zero OTG blocks – these can be used for setting the OTG mode for a Raspberry Pi Zero (such as setting it to Ethernet over USB, or MIDI over USB). The reason it isn’t on the image on http://www.PiBakery.org is because I forgot to update the image! I’ll do that soon, thanks for pointing it out. 2) This is by far the post popular request, and I’m working on adding it in right now. If you follow @PiBakery on twitter I’ll post an announcement there when that’s released. I can definitely do that – I’m actually currently rewriting the installer so you can choose Raspbian Full or Lite, and I’ll add that in as well. Absolutely brilliant! This is far more important than just a tool. So if I flitter between two houses that have different WiFi settings, I just add two blocks and it will find each WiFi domain? Exactly, and even better – if you then go somewhere else with another WiFi network, you can put the SD card back into a computer running PiBakery, PiBakery will detect that and load the previous settings, and then you can drag out another WiFi block with the “On Next Boot” block, sand save your changes back to the SD card! Truly outstanding, I am going to a fresh install of Jessie.. then try this.. wow… amazing work..
Great project David Ferguson, its very very helpful. Thanks – I’m so glad you find PiBakery useful! I must take a look at how you have done this but it does bring nixos to mind. nixos, http://www.nixos.org, “has a completely declarative approach to configuration management” ie You write a specification of the desired configuration of your system in NixOS’s modular language, and NixOS takes care of making it happen. It looks such an obvious idea: but only after somebody else has actually gone ahead and thought it up and (more importantly) built it ! (“Click ‘n Configure” ?) Nice one. Well done young man. I’m about twice your age and just learning to program but know you are TRULY and inspiration. they provide slimmed-down deployable VMs for various hypervisors that are all pre-configured for a specific task. Best of all, it’s Debian. In order to build and maintain all of these images, they have a special image called TKLDev (TKL is short for Turnkey Linux, obviously). Using a few short lines in a makefile, it is possible to define new builds and create images that serve different purposes. It’s an incredibly simple, slick, and powerful little tool. Since they already have a wealth of images and definitions for TLKDev, porting that over would help out a ton of people in the RPi community. They replied that it is definitely something that they want to pursue and would even be able to host the images on their site, but they just haven’t had the time or resources to work on it. If anyone is interested, I would be glad to put you in touch with some of the founders and maintainers. I think it would be a great way to build, maintain, and distribute new (and existing) images quite easily. I have some questions. Do they go here, or is there a forum somewhere? Is there somewhere I can see a log of any failures or warnings during 1st or “every” boot? (eg. failed package install, or failed download from urls, or python program which didn’t start for some reason). I looked through /var/log but didn’t find anything. What happens if a step in the chain fails? Are the following steps attempted? Are the failed steps retried at next boot? If I need the Pi to re-run 1st boot, following a failure of one of the steps (maybe some web site didn’t respond to a file download request), do I need to rewrite the SD card, or is there some way to re-trigger 1st boot? You can ask your questions either here, or you can submit a new issue of the PiBakery GitHub page (https://github.com/davidferguson/pibakery/issues/new). At the moment there isn’t any log for PiBakery – but this is something that I’m adding in and should be in the next version of PiBakery. If a step fails On First Boot, that step will be skipped, and never run again. Again, this is something that may change in the future. To re-run First Boot, you should have a look at the On Next Boot scripts. See http://pibakery.org/docs/edit.html for more information about that. Logging: good that you are working on a log, as without one it is difficult to debug newbie things like authority issues, or even to be certain that everything completed. Re-run 1st boot: I had read about On Next Boot, but have just discovered how your SD card update option is triggered. That improves some of the tedium and delays while trying to debug. What I was asking about was whether there was any way on the RPi to trigger it to rerun On First Boot at next boot. ie. (provided that my OFB block was designed to OK for rerun) to trigger a re-initialisation of the RPi w/o having to pull out the SD card, and rewrite it? to enable the nextBoot script. thanks. Will test this further in the morning. At the moment firstBoot.sh is empty. Presumably because I put the SD card through a PiBakery card update procedure. BarryM: I can’t reply directly to your comment, so I’ll reply here. Yes, if you’ve used the Update feature of PiBakery, it will erase the firstBoot.sh script. But up until the time that you use PiBakery Update, the script would have still been there. There seems to be something I don’t understand. The following url downloads a txt file in the RPi’s browser, but gets a 406 when I use it with PiBakery’s Download File block. It looked into GIT, and see that it eventually calls a Linux curl command. I tried a curl command from inside a terminal session, and got a 406 error there too. What is acceptable in your Download File block? Would you be able to create a new issue on the PiBakery github page (https://github.com/davidferguson/pibakery/issues/new) for this, and include the exact error message and what you’ve tried to get round it? tried to set a static ip on lan with the pibackery install (not through pi bakery but after) every time after setting static i could not ping out, dns would not resolve. set static (same method) all dns resolves, all is well. I would like to use pi bakery for obvious reasons. Can you describe how PiBakery updates work? I notice that PiBakery seems to dial out when I open it. I received the blocks update a day or so ago (thanks). What about updates to PiBakery itself? I saw at Git and on twitter that there is a new version, but I don’t seem to have it. ie. no Windows resizing here. What should I see if there is an update to PiBakery? How do I tell which version I am on? Is there a release note with a new versions giving heads up for any changes? One other thing, is there a typo on your web site here? Point #2 … “Click on the Hats category” ? … should be “Startup category”? Thanks – “Hats” is what the “Startup” category used to be called ages ago, and I’ve obviously forgotten to update the docs when I changes it. As for updates, PiBakery will not automatically download application updates. The reasons for this are partially technical and partially my thoughts on auto-updaters. The technical issue is that without having code signed PiBakery (and I’m STILL waiting on my code signing certificate to be processed – 5 weeks after I bought it!) I can’t use Electron’s official updater, and although I could, and actually did write my own, it had issues and I wasn’t sure how best to resolve them. The other reason that prevented me from adding an autoupdater was the fact that anyone with my GitHub password would be able to push out new code that would run on many people’s computers. Although I do have a unique password for GitHub, and I consider it very secure, it’s a big risk, and not one that I’m really prepared to take. Block updates and Raspbian updates are OK, as they are never downloading code that is going to be run, only files that are used with PiBakery. Basically, for the moment at least, you’ll need to download the latest version of PiBakery and install that manually if you want the latest features. If it helps, you can have multiple versions of PiBakery installed at one time, so you don’t have to uninstall the older version if you don’t want to. If i need a restart for Pi Zero OTG mode ethernet to work, why is there no “On Second Boot” option, so i can reboot and then continue my package downloads, etc after it reboots? Then with your reboot command, before rebooting set that value to 1++. On new boot you’ll know which boot # is happening. How do the majority know about the improvements and the bug fixes? Is not easy to see which version we are running. Is not possible to see whether the version on your web site available for download is any different. So? … run a 1.2gb download, and look for any differences? * show the executing version number on PiB front panel somewhere. * popup an info dbox during pgm initialisation to say that a new version is available. Give a download link. * show the current version number on your downloads screen, and provide a list of changes for each version. Awesome work, David… thanks so much for sharing! Great Application.It saves my time.Absolute work. Just given this a download – so awesome man, very handy tool. Also I like the little click noises when things slot together – tickles my brain.